Eighty-two jobs will be lost when seven Poundworld shops close in Scotland next week. The discount goods retailer, which went into administration in June, said the stores would shut for good on 24 July. Poundworld had already announced plans to close 105 of its 335 UK stores, having failed to strike a rescue deal. The premises closing in Scotland are in Aberdeen, East Kilbride, two stores in Irvine, Perth, Queensferry and Robroyston. As well as the seven shops north of the border, there are 33 closing in other parts of the UK. 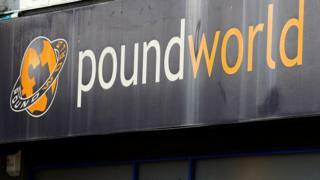 Poundworld's administrator, Deloitte, said it was still looking for buyers for all, or parts, of the remaining business. Clare Boardman, joint administrator, said: "We would like to thank all the employees for their continued support and commitment during this difficult time. We are keeping staff appraised of developments as they happen." Poundworld went bust in early June after struggling with tough competition on the High Street from rivals including Poundland and Poundstretcher. It was also hit by the fall in the value of the pound after the 2016 Brexit referendum, which has pushed up the price of imported goods. Which Scottish stores are going?